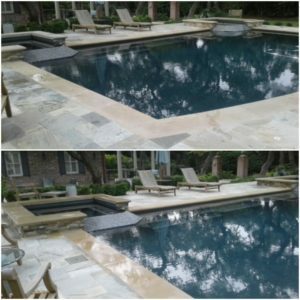 If you’re having some troubles with your Flagstone Sealant Dallas surface, it can be confusing trying to figure out the next move. Do you have a lot of stains, discolorations, and scratches that you’re trying to eliminate? If so, we have the solutions you’ll need to figure this out and get the results you’re looking for. With Texas Stone Sealers on your side, you’ll have the resources you need to start achieving the appearance you want from your surface. Made out of quartz and feldspar, flagstone is very popular amongst the Dallas area. This is something that you can find in and outside of many different residential and commercial buildings in Texas. Pool decks, patios, walkways, and landscapes are all common places where you can see this stone installed. Customers love it because it gives them a great deal of aesthetic beauty without costing a fortune. Users of flagstone will to remember that this is a porous stone that needs to be carefully managed. When you have stains, scratches, and dents on your flagstone, it can cause it to become unsightly extremely quickly. You’ll need to ensure that you won’t have to deal with lasting damages by properly applying a sealant to your surface. This is a process that can help you protect your material against potential contaminants for years to come. It’s a relatively quick and simple way to give yourself maximum protection for your tapestry. Before applying any type of sealant, you’ll first have to make sure you properly clean your surface. Are you dealing with some stains after spilling food and drinks on your patio? Maybe you’ve got some dirt and debris on your pool deck. These are the exact types of stains you want to block out, so it’s important to deep clean your surface before doing work. Failure to sanitize your surface can cause you to lock in the contaminants you’re trying to protect yourself from. If you haven’t worked in this industry for a long time, you may not always know what to do with your stone. After all, each and every surface is different. Navigating a restoration can be very difficult if you’re not a licensed and experienced expert. Make sure you give yourself the best chances at success by leaning on our professionals. When you have the TSSPRO Sealant on your side, you’ll have everything you need to properly protect your surfaces. Call us at 888-958-0556 for more information on our services and products. Over the years, our sister company in Dallas has been helping local customers figure out their stone needs. Cleaning, sealing, and maintenance are all things we offer in our services, but we’ve noticed that this is sometimes a lot harder than it needs to be. Some of the biggest brands in our business are manufacturing products that simply don’t do what they’re advertised to do. You may notice that some of the top manufacturers promise to provide customers with high quality products, but they fall short every single time. We’ve noticed this during our careers, and we have grown tired of using faulty products that don’t get the job done. Low quality acrylic products serve no purpose to anyone, customers and employees included. When you have to deal with things like this, you won’t be effectively sealing your stone. You’ll merely be using a low-quality bandaid solution that fails to provide you with any lasting protection. When you do this, you won’t be able to get the protection and performance you’re looking for. This is where our products can come in. Once we realized that something needed to change, we began working towards making effective change take place. Our professionals consulted with some of the best minds in the business to provide you with lasting products and solutions that make sense. With this in mind, now you’ll be able to depend on a line of propriety sealants that can get the job done very consistently. The TSSPRO-100 was the first sealant in our inventory. Ever since then, we have continued to add to our inventory and expand our products. Are you trying to find products that will help you defend your surface against mold and mildew? Maybe you need some high quality, fire resistant sealants that offer premium protection. If so, you’ll be able to count on our sealants to help you get the most out of your surfaces. All of the products in our line are all-natural and alcohol-based. These provide you with commercial grade quality and protection that will not disappoint. Our products are made for residential and commercial use, and you can count on them to be affordable and accessible. We place a high priority on making sure the sealants we use are always of high quality and made to withstand the test of time. Make sure you have the right Flagstone Sealant Dallas support by selecting TSSPRO Sealant to handle your troubles. We understand what it takes to properly clean, seal, and maintain a surface. If you’re trying to figure this out, contact us today at 888-958-0556. Our team is ready to consult with you and develop a solution that makes sense for your surfaces. With our experts around, you’ll have the expertise you need to renovate your floors for an affordable price. Dallas is one of the fastest growing cities in all of America. Located in Dallas, this city is part of the greater DFW (Dallas-Fort Worth) metropolitan area. In the beginning, our city was heavily dependent on oil and cotton to make our economy continue to move. Years later, in the 1980s, we became one of the prime locations for real estate. If you were someone who was looking to buy or sell a house, Dallas was the place for you. Today, we are proud to say that we have a well-rounded, multifaceted economy that helps our professionals thrive in many ways. Visit our city to learn more about our culture and seek greater opportunities!